My wife asked me what I wanted to do for my birthday last Sunday. Naturally I told her that I wanted to find a card shop nearby and grab some grub - not necessarily in that order. And so, she took the girls and I to lunch at a diner on the way to a card shop that she researched and chose because it had great reviews. It was only open from 1pm-4pm on Sundays and we got into town right around 2pm but couldn't find the place from the street. Apparently the shop sits on the second floor of a yoga studio. We parked in the back..no one else was in the lot. We tried to open the door. Locked. No problem..we'll walk around the front. Tried to open the front door. Locked. Walked around the back to our car. She called the shop. Got their voicemail. It's open from 1-4 on Sundays - except in July and August. You may be asking why I didn't go on Saturday? Well, Saturday was Di's niece's birthday - and the whole family spent the day at my brother in law's. Except me. I was supposed to go. I expected to go. But then I had a bit of a manic episode that started off as a panic attack and ended up feeling more like a complete mental breakdown as the weight of unrelated issues stacked up on top of me- including major changes at work, a lack of a reliable internet connection, my mother's failing health, etc. etc. ...and the fact that my 38th birthday was falling on the anniversary of Charlottesville. The thought of spending a day with my utltra-conservative in-laws on this particular weekend was the back breaker. I couldn't do it. Thankfully, I didn't have to. I stayed home on Saturday, packed up the Sports Card Tour prizes, and began reorganizing my card collection for the ten millionth time. In some of the Sports Card Tour stops I hinted at starting the 1986 Topps football set. I have no emotional connection to it; 1986 was the first year I started collecting baseball cards but the first football card I ever saw was from the 1985 set (Bob Baumhower, which was wedged in the backseat of my dad's station wagon) '86 is just a highly condition sensitive set loaded with hall of famers such as Rice, Steve Young, Reggie White, and so on. 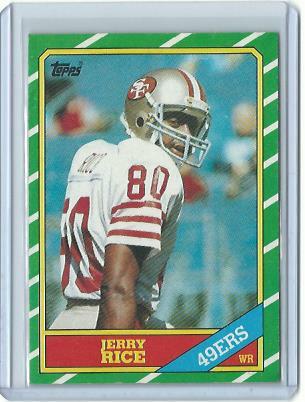 About two years ago I nearly bought a PSA 9 Jerry Rice RC from 4 Sharp Corners for about ten times the price I paid for this copy ($429 I think?). The reason I considered it is because a dozen years ago I bid on a PSA 9 Robin Yount RC thinking I could get it for $300. I was outbid; it sold for about $315. Today Yount 9s sell for three times that. 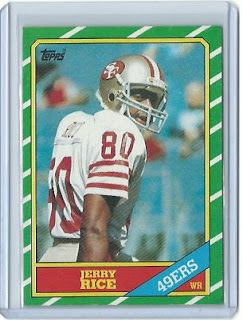 1986 Topps football cards might be even harder to find centered than 1975 Topps baseball (though I have absolutely no evidence to back this up.) And Rice is, without a doubt, the greatest wide receiver ever - and possibly the greatest football player in the Super Bowl era. This comic book shop might have overpriced their boxes, but I felt very comfortable paying under $50 for the Rice RC. And so now I am fully committed to completing the '86 set. I doubt anyone reading this would happen to have some singles lying around, but if you do have any 1986 Topps football for trade please let me know. I'm not going to be a stickler for condition-anything with decent centering and no creases will be accepted. I did get my birthday sports card fix - but not from a card shop. As I've mentioned before on this blog, my LCS is Target..which of course limits my choices. 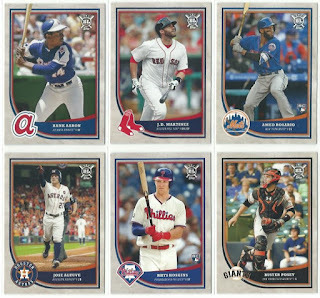 I can't purchase supplies or single cards, but I can grab $50 worth of fat packs and blasters when the sets appeal to me. 2018 flagship is a huge improvement over last year's design. 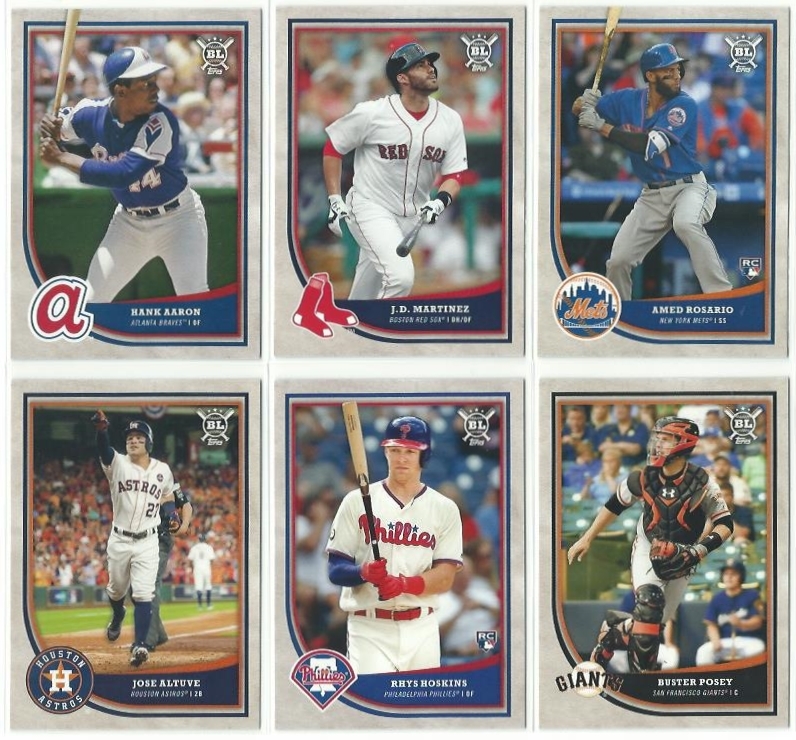 I'm nowhere close to finishing this set (I've got about 100 cards of each series) so if you have any dupes to trade I'll be happy to take any and all, regardless of card number. I didn't just go for flagship, however. After reading dozens of positive reviews and blog posts about Big League Baseball I had to give it a try. So far I'm on the fence about adding it to the list of sets I'm building. It's a nice enough set for sure, and the price point is a plus. But I've got so many unfinished set projects already. Can I really start two more sets this year? Then again..after spending the past week reorganizing my collection I've actually got more room for set builds than anything else. My base card binders are filled to capacity. I could use some new binders but the only ones I see for sale have much smaller D-rings than my older binders. I'm still holding out hope that I can find the large ones if I can ever get myself to a real LCS. All of my team collections are in separate boxes. I've got some room to add more Packers cards, but the Red Sox and Devils boxes are stuffed. There's plenty of room in my star player boxes and a little bit of room in my 'hits' boxes. So I've decided that storage space will dictate my priorities for the rest of the year. Even though it was against my better judgment, I requested shipping on the 41 cards I had in my COMC inventory. That will chip away at most of my sets - but it won't complete a single one. And so I've updated my wantlist a third time to try and cross off some set needs. Once I fix my home internet connection I'll join TCDB in the hopes of making more trades. Thanks for reading this. Hope you're all having a great weekend! Glad you're able to have some fun with the cards, at least. I got your contest prize yesterday...still processing it, hope to get a post up around noon tomorrow. I don't have any from that football set, but it's a great design. If you need any help when you join the Database, feel free to ask me. There's literally never a time when I'm on the internet that I don't have it pulled up in at least one window. Happy belated birthday! 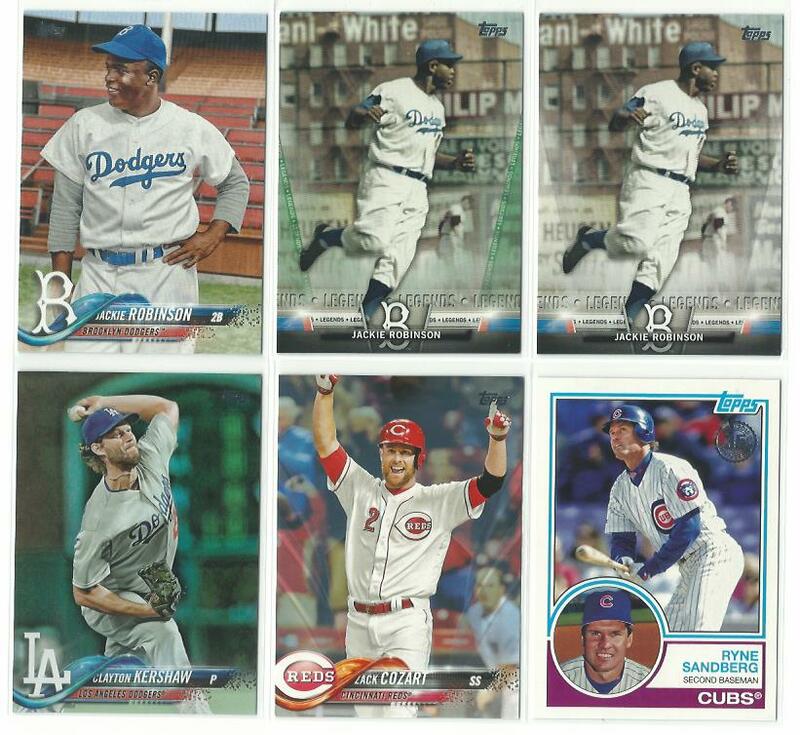 That Jackie Robinson variation is a beaut’. Happy belated birthday! I passed on a couple of nice looking Rice rookies that were in the $20 range at the last show that I went to, maybe I should have bought one? I finally bit the bullet and joined the TCDB, but as expected, I can't figure out how to do anything on the site, and I hate asking for help on something that's probably super easy. So for the moment, I'm a registered user on the site... I'm just not using the site. The people on TCDB are extremely helpful! Once you get a feel for the site, it's quite useful! The first football cards I ever had as a kid were a random pack's-worth of 1986, highlighted by a Bernie Kosar rookie I think I've still got somewhere. I too received my Sports Card Tour prize the other day.. big thanks! I'll get a post up before too long. My monster sports card tour box arrived this week. It'll take me probably months to go through! 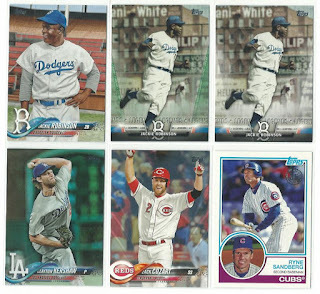 Nice pull on the Jackie variation. I'm a bit distressed they wasted that other Robinson image on the Salute inserts. It's too cool for those things. The common theme is everyone getting their prizes and mine is in hand as well. Thank you. A post will most likely be in sept as I am still playing catch up. Happy belated birthday! Super sorry to hear about the panic attack. We've connected over that issue before and they're no joke. I hope you don't have to suffer through another one anytime soon. As for the cards... I love that #80 rookie card and the #42 photo variation. 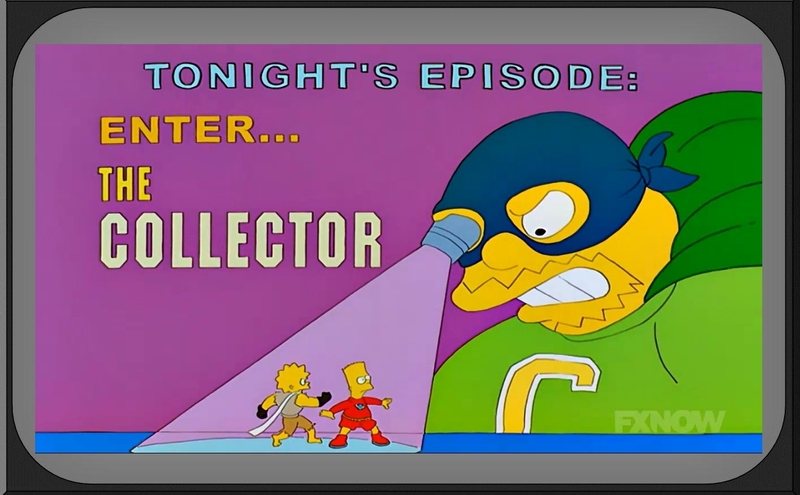 Great additions to your collection. I received your contest package last week and can't wait to dive into it. I've spent the past two weeks organizing and building care packages for fellow bloggers. As soon as those are shipped out... I'll get around to busting open your box. Thanks in advance! Happy belated birthday! Hope you're feeling a bit better.